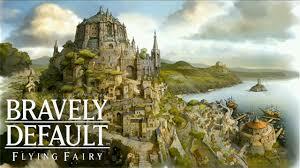 In short, Bravely default is a beautiful game. The world map and dungeon environments are clean and pretty, though fairly standard for the current-gen JRPG. If your eyes can handle the 3D feature, use it to make these environments truly pop. 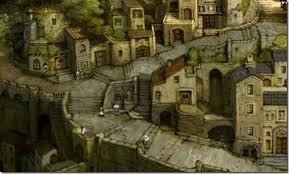 More notably, the cities (though small in size) feature an old-school art style that never fails to please the eye. In battle, the animations are smooth and flow seamlessly. Bravely Default takes few risks with the story (the latter half of the game is a notable exception, but I won’t spoil anything). Per usual, four brave yet naïve heroes from diverse backgrounds find themselves fighting together to challenge the evil that threatens the land. Specifically, you’ll follow duty-bound Agnes in her quest to awaken the four crystals of the world. Throughout the course of the story, your party will come into contact with a wide array of characters that badly want to kill you. You can look forward to meeting a rabid hunter and her slightly less insane sisters, two men that have been alive for entirely too long, and an honorable swordsman. For the JRPG crowd, this is nothing out of the ordinary. However, the many quirks of each character and the associated dialogue should be enough to keep you interested. In line with its name, Bravely Default introduces a unique element to the battle system: the ability to brave and default. While default functions as ‘defend’ normally would, it also allows you to ‘store’ the current turn for later use. Brave, on the other hand, allows you to act ahead and unleash several turns worth of hell on your enemies. This mechanic does make for some strategic boss fights, but allows you to breeze through most random encounters if your characters are fast enough to act first. 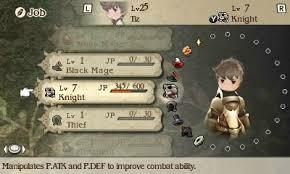 Bravely Default also employs a rather flexible job system that allows you to master any or all of 24 jobs (or classes), each with unique abilities. In addition, you can assign a subjob to each character, allowing for a wealth of custom character combinations – assign a fully maxed Swordmaster to a magic-user and use the Free Lunch ability to eliminate MP costs for two turns. Or, combine a Spiritmaster and White mage for full group heals from Cure, the most basic of healing spells. The characters love to talk, and you’ll spend quite a bit of time listening to them. Luckily, both the sound quality and voice acting are good. You’ll probably learn to ignore Agnes’s voice and look forward to Ringabel’s, but likely won’t hate any of them. While the world map music is catchy, it never changes, which may present a problem for some. The boss fight soundtrack, however, is the one to look forward to. And don’t worry – you’ll be fighting many (maybe too many) bosses over the course of the story. There are two things you need to know about the replay value – I’ll start with the positive. In theory, Bravely Default should present a fantastic replay value, considering the ridiculous amount of possible job and subjob combinations. This is the min-max, perfectionist dream. Unfortunately, the latter half of the game provides you with more replay than even the most dedicated gamer may want. Again, I won’t spoil the story, but keep this in mind. Bravely Default is a charming and enjoyable game. It looks and performs well on the 3DS and it’s an absolute joy to tinker with the job system. While the story isn’t likely to win any awards, it is passable and presents enough mystery to keep you pressing forward. Unfortunately, the second half of the game is the perfect example of the developers taking the easy way out. Overall, Bravely Default is a worthy purchase for the gameplay alone, though gamers should prepare for potential disappointment later in the game.